we know you’re there because we play with you most of the time. 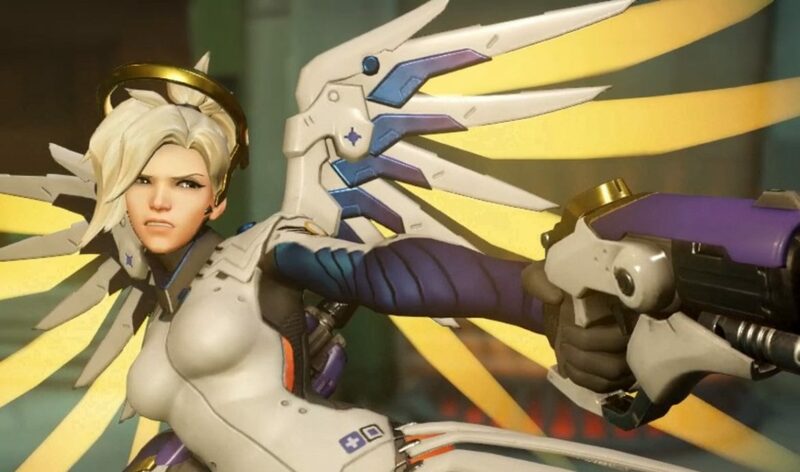 I remember awesome rounds with a full group of guys which treated me just like everyone else and cheered me as I got PotG with Mercy. I daresay that most of you male players are pretty okay, the random annoying ranter because his Genji didn’t get enough healing behind enemy lines aside. But then there are the few assholes. And I’m not even talking about the random ranter which is there oh-too-often who spews insults and rage into the chat if he doesn’t like the game. I mean those who either get downright nasty when they hear in voicechat that a woman is on the team even without having seen her play. Those who start sexualized insults like c*nt (“Fun” game I had where a teammate started insulting me ‘for playing bad’ – while I had gold elims with Symmetra, I might add – in his native language. Bad luck for him that it’s my native language as well. He then told everybody on our and the enemy team to report me because I called him out). But you know what’s worse than insulting people? This happened just a few days ago. The girl in question had the bad luck of having a female name in her battletag which was enough for two guys from the enemy team to get disgusting, and from the way they talked it had been going on for one or two games already. And we’re not only talking about “hey, if I guess the next map will you date me” but about graphic sexual innuendo. It didn’t matter she told them more than once to stop, it didn’t matter that both Anna and I told them more than once to stop. They just upped the volume and got more explicit. Of course we reported them. Of course we muted them. But the thing is: it was only us. The women on the team were the only ones who spoke up. Anna and I were in a group with a guy at the time who was equally disgusted by them and even told the harassed girl that he was – but he didn’t say anything to the offenders. I don’t know if he reported them, he later told me he “just ignored them and continued playing”. Let me be clear here: that’s not enough. Yay for you if you’re not “that guy”, yay for you for voicing your support towards the victim. But SHAME on you for not speaking up to “that guys”. There aren’t as many female gamers out there as I would like, even fewer like to “out” themselves as women in voicechat (which is kind of essential in competitive). And we all know why, yes, even you Good Guys know it even if you don’t like it: we have a misogyny problem in gaming. We have a sexual harassment problem in basically every game. Sexual harassment is not the same as verbal abuse. Of course it annoys me if someone insults me – but it doesn’t get to me like these explicit disgusting things. If someone rages at me because I killed him too often that’s not my problem but belittles him for taking this game way too serious (and seemingly putting too much self-worth in his playstyle, sorry if you’re not as good as you think you are…). But if someone starts attacking me for my gender – and yes, sexual statements are attacks! – it is him trying to belittle me in the worst way possible. It is him trying to make me an object for his pleasure while fully knowing it makes me uncomfortable. The above-mentioned game was one of the worst I played because of the chat. It unsettled and enraged me to no ends and I wasn’t even the target. But you know what would’ve helped? If everybody else, all the Good Guys not participating in the harassment, had stopped playing and told the two guys to stop. If EVERYBODY had said “Not like this”. If EVERYBODY had immediately reported them and told the victim that she’s safe and that they will not tolerate this kind of behaviour in the game. Imagine that: game comes to full-stop with two idiots jumping around until they left the game with 10 reports on their tag in one game. You think they would have continued? But the way it went the just continued playing and the harassed girl left the game. I’m still mad when I think about it. So, dear Good Guys. It’s not enough to silently be annoyed by Those Guys. Not nearly enough. Get loud, get vocal, report the offenders, support the victims. It is up to you to make gaming safe for everybody. You want to be the Good Guy? Then BE the Good Guy.